For these women, growing food is an inherently political act. Kanchan Dawn Hunter of Spiral Gardens said farming has helped heal her relationship to the planet and other people. Close your eyes and imagine a farmer. If you've just pictured a white guy in overalls and a straw hat, there's a reason for that. The history of farming in this country has been dominated by images of white men. But it's not because women and people of color haven't been there all along growing food, only that they've been excluded from the popular imagery as well as from owning land and accessing the necessary resources to farm. Now, a new generation of cis, trans, and queer women farmers is changing the narrative. Across the country, these women are planting crops and raising livestock, from fields in the Midwest to urban farms in dense cities on the coasts. 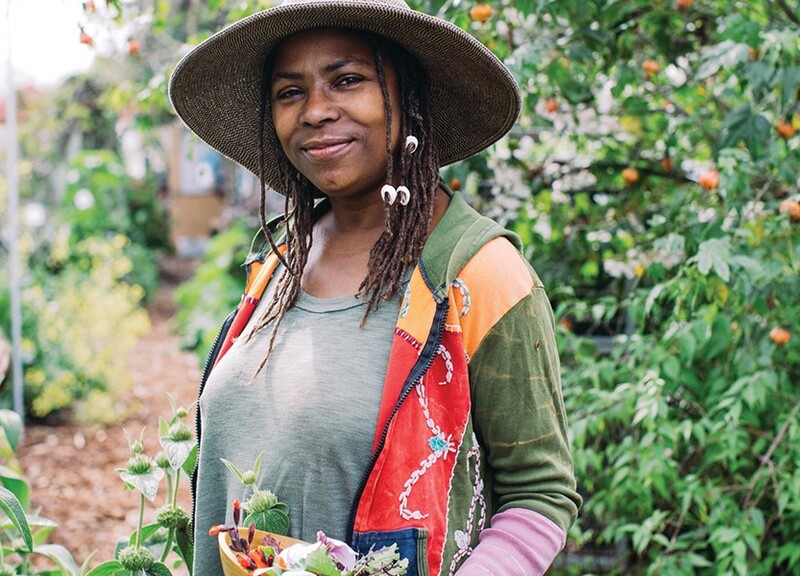 Here in the East Bay, women aren't just growing food; they're also cultivating and empowering communities as well as re-establishing a connection to the earth and themselves. Kanchan Dawn Hunter is the community outreach director for Spiral Gardens Community Food Security Project, located in South Berkeley. Sales from the nonprofit, low-cost nursery go to fund its free education programs taught at its quarter-acre community farm, which is located across the street. "What we do here at Spiral Gardens is very political, absolutely," said Hunter. "I think anytime you grow and eat your own food, it's political, it's revolutionary. I believe that especially for Black and Brown folks, food sovereignty means growing your own food and having access to your own soil." In addition to offering free classes on various aspects of gardening, Spiral Gardens also hosts community work days on Sundays. Volunteers are allowed to pick and harvest whatever they want. "It's a community commons," said Hunter. For Hunter, farming grew out of a childhood passion. Although she was raised in Southern California, she spent summers in Virginia, where her uncles and aunts had huge farms. When Hunter had her first child, she decided it was time to start growing her own food. While working at the Ecology Center, she learned of a proposal for a community farm by Daniel Miller, Spiral Gardens' executive director. Hunter ended up falling in love with the project — and with Miller. But she also knew that Miller, who is white, couldn't be the public face of the project. "You have to get in there and get the community involved, which at the time was mostly Brown and Black folks," she said. That was 15 years ago. These days, the neighborhood around Spiral Gardens has gentrified, changing the demographic of the residents she intended to serve. So her work has expanded to include outreach to other organizations working with communities of color. "It's so important for folks of color to stay connected to the land, and to the soil, because that's where our power comes from," she said. Kelly Carlisle has similar community-minded goals. In 2010, she founded Acta Non Verba: Youth Urban Farm Project, which aims to empower inner-city children through urban farming. Through its camps, field trips, and farm visits, the nonprofit teaches kids how to grow produce on a quarter-acre farm in deep East Oakland. One hundred percent of the proceeds from the sale of their produce goes to savings accounts for the kids. So far, they've raised close to $8,000, Carlisle said. The goal isn't to turn every child into a farmer, but rather "to expose kids to all the things they can be, and to understand Black and Brown people can do those things." In fact, they've been doing them for generations. Gail Myers first learned about Black farmers in the late '90s, when she was studying cultural anthropology at Ohio State University. Myers began researching and interviewing Black farmers and discovered the challenges they faced, as well as the fact that many of them had been practicing what has come to be known as sustainable agriculture. While her colleagues went on to get professorships, Myers decided to support these farmers. In 2003 she made her way to the Bay Area and found that Black farmers in California faced similar challenges as those in Ohio. Many of them weren't getting access to farming resources through the government, and worse, some had their land taken outright. Others were given "the runaround" when they did get a loan. But there was a positive effect of this disenfranchisement. "Because they couldn't get loans for tractors and pesticides, they continued to farm the same natural ways that African American farmers have done for decades," she said. In 2004 Myers cofounded Farms to Grow with a mission of supporting Black and underserved farmers around the country, especially those practicing sustainable agriculture. In 2013, the nonprofit launched the Freedom Farmers Market in Oakland, directly connecting consumers to local Black farmers. Myers said the farmers' market is about more than selling food. "It's continuing this legacy African Americans have had to food and relationship to community," she said. "The enslavement period has created a huge sense of shame," she continued. "We're seeing that dissipating but historically that hasn't been the case. So what we're doing is reconnecting people to this place. Instead of shame, it's celebration. So we have a watermelon-eating contest and pea-shelling contest. ... These are ways in which African Americans used to be integrated in food all the time." Later this year, Myers plans to move to North Carolina to become a farmer herself. East Bay organizations such as MESA and Urban Tilth also work to promote a more sustainable and equitable food system, and their ranks are filled with women. Natalia Pinzón Jiménez, the director of programs and education at Berkeley-based MESA, estimated that 60 to 70 percent of the participants in their international farm program are women, and the percentage is even higher in their Bay Area farm training program. Still, women are very underrepresented in the ownership and power dynamics in the food system, noted Leah Atwood, the director of programs and partnerships at MESA. "We're the majority of the people growing food but own very little of the land," she said. Traditionally, women got into farming through two methods: "marry it or inherit it," said Alli Cecchini, the founder and executive director of First Generation Farmers in eastern Contra Costa County. Cecchini falls into the latter category. Her family has been farming in the area for about 100 years. But even though she grew up around farming, Cecchini never appreciated it. "I thought of it as something my parents did that was annoying," she said. Living in Israel and going through a divorce changed her perspective, however. "Being outside growing things, it was sort of a therapeutic outlet that turned into something more," she said. Her 12-acre organic farm grows more than 40 different kinds of vegetables, generating close to $100,000 in revenue annually, and it's all for training purposes. (They sell through farmers' markets and to local restaurants.) In addition to its popular World Wide Opportunities on Organic Farms, or WWOOF, program, which links volunteers with organic farms, First Generation Farmers also trains beginning farmers through its recently launched Urban Edge Sustainable Farming. Cecchini believes more women are starting their own farms because it's the only way for women to get into farming. "A lot of men can get those jobs that women can't," she said. In her own experience, Cecchini said she's faced considerable challenges as a female farmer. She said male volunteers that came through the WWOOF program would belittle her and her coworker. "It was hard for us to give direction or orders and constantly get argued with or told we're doing it wrong," said Cecchini, explaining why they decided to reserve most of the spots for women. Cecchini said her gender has also been a factor in her business dealings with local restaurants. "I've had the most difficulty with chefs," she said. "I think it's because I'm a woman. They are much more responsive to men." Cecchini said she often sends her husband to talk to chefs. Hunter cited similar instances of men being dismissive of her authority or wanting to take charge. And as a woman of color, she said people sometimes assume she doesn't know what she's talking about or are surprised by her knowledge. But the very presence of women — and women of color — farmers counteracts this stereotype. "Part of my personal work is to change what a farmer looks like," said Carlisle. Along those lines, she calls Acta Non Verba a farm, not a garden, saying the difference is that a garden is for personal use, whereas a farm feeds the community at large.